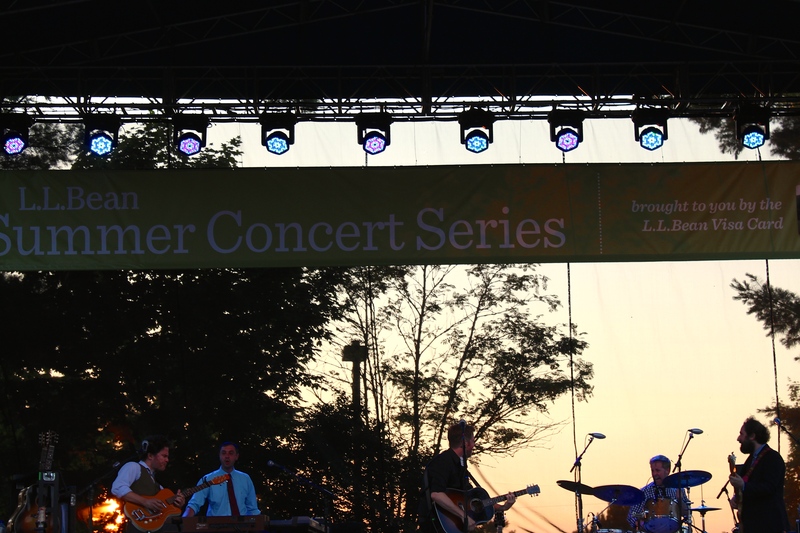 I hadn’t seen a show in almost two months (anyone else feel like concert offerings this spring were slim? 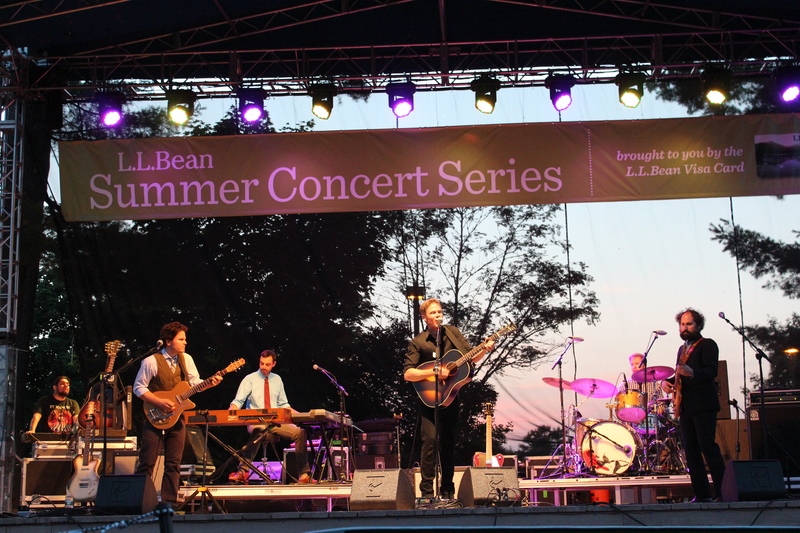 ), so when our friend Bartlett sent a group email invite to join him for Josh Ritter at L.L.Bean, I decided to go for it even though I usually boycott those shows. 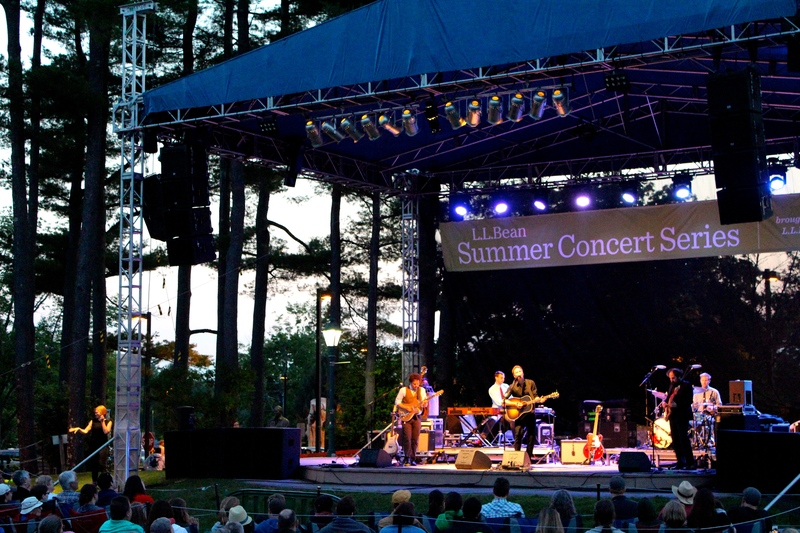 (I really wish L.L.Bean would build an amphitheater worthy of the great artists they bring to Freeport). Of course, in true Bartlett fashion, he was the last one to join us before the show for a group dinner at Grittys. Michelle has been housesitting in Freeport, so she went at midnight to set up a blanket for the group and got us as good a spot as is possible at an L.L.Bean show. As we arrived at our awesome spot (thanks, Michelle! ), students of mine at an adjacent blanket chimed “Hi, Ms. Candland!” in unison—it was nice to see you, girls! AH! 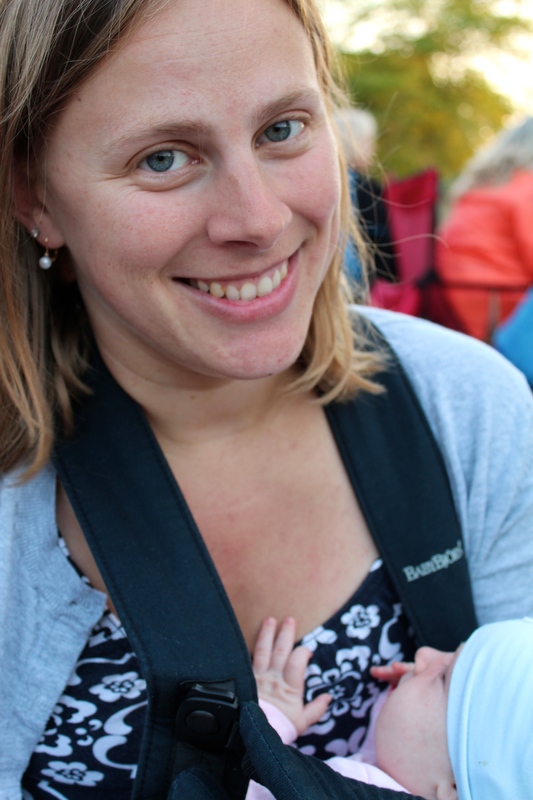 I almost missed the most important detail of the entire night—this was almost six-week-old Mira’s FIRST CONCERT! 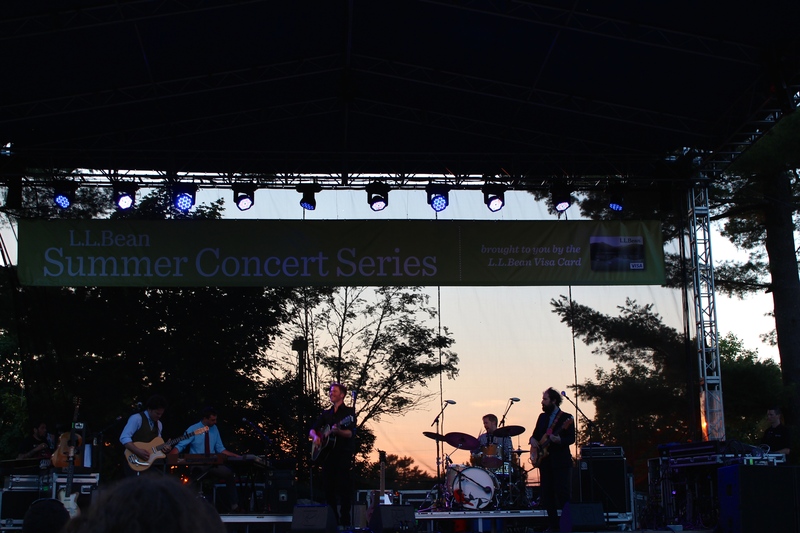 Most of the gang had never seen Josh Ritter, but wanted to see him because we know that our dear friend and gifted singer songwriter Max Garcia Conover (who sadly couldn’t make it due to car trouble) credits Josh as one of his strongest musical influences. 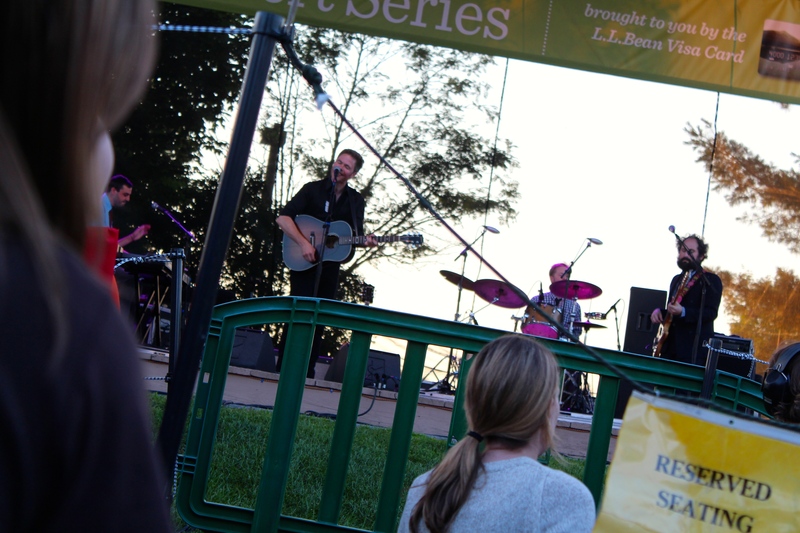 Josh Ritter is always a pleasure to see live. I don’t there’s a person happier to be on stage performing than he is—Josh is most often seen smiling from ear to ear. There’s something nice about being around that kind of joy that makes me go back to Josh’s shows time after time. 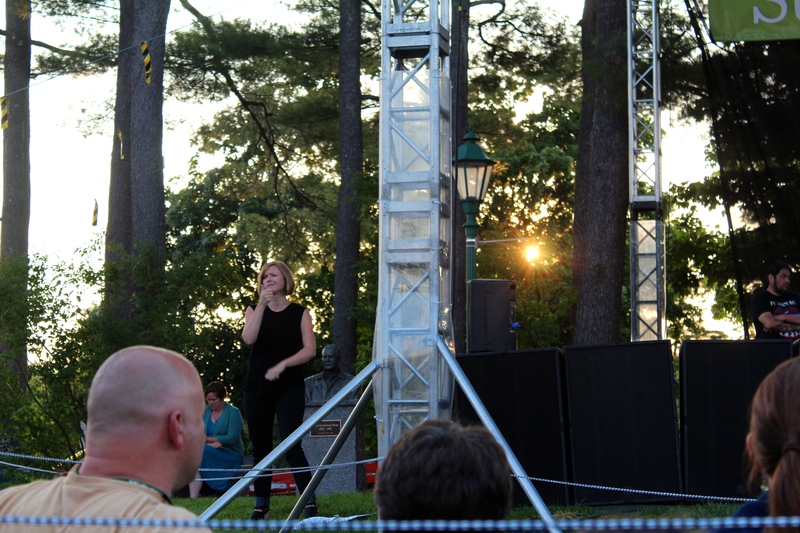 My friend Grace was also excited to be working that night—her sign language interpreting during the show was a blast to watch! This is the best view a blanket set out at midnight will get you at an L.L.Bean show. 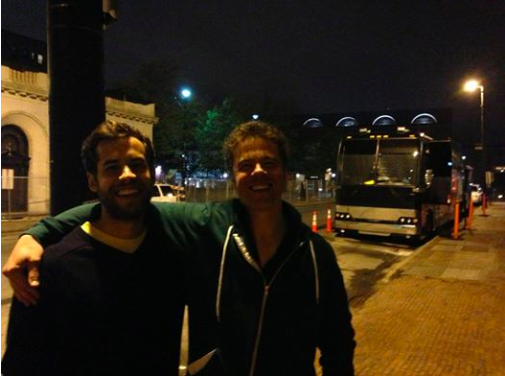 Max Garcia Conover and Josh Ritter. May 2013. Courtesy of Chris Bartlett. “Hopeful” was the first song of the night and it’s one of my favorites. Josh talked about how thrilled he was to be playing with his fabulous band and it was great to see those familiar faces on stage, too. 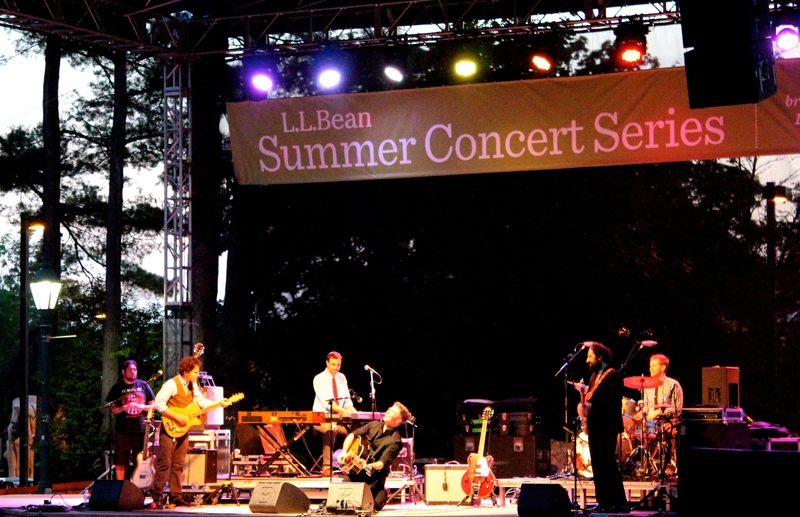 Multi-talented Austin Nevins is incredibly gifted on guitar (here’s my post from a show Austin played with Dietrich Strause and Max). Sam Kassirer not only plays keys with Josh, but also produces amazing music from the likes of Josh, David Wax Museum, and Lake Street Dive at The Great North Sound Society in rural Parsonfield, Maine. “Here at the Right Time” and “Change of Time” were both lovely. Josh joked about being from Idaho, who are a “proud seafaring people” from the banks of ancient Lake Idaho. 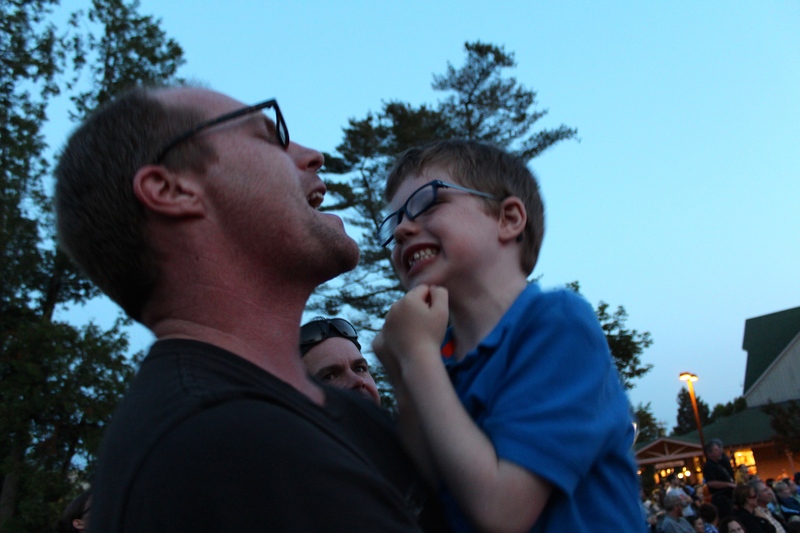 I took a peek behind me and noticed my dear friend Ken and his kiddo Liam dancing and singing along. I ran over to join them for a “Kathleen” sing-a-long. The view from the dancing section. Josh talked about how much he loves Maine and said that he’s not allowed near sharp objects during recording sessions (at Sam’s place in Parsonfield) because it often ends badly. During a recording session, he opened a can of beans and cut himself badly enough that he needed medical attention, and instead of driving the hour to the nearest hospital, a kind veterinarian sewed him back together. Sounds like a perfectly Maine scenario to me. They wrapped their set with another of my top favorites, “Joy To You Baby,” which particularly resonated with me as a recently brokenhearted single person–“There’s pain in whatever/We stumble upon/If I never had met you/You couldn’t have gone/But then I couldn’t have met you/We couldn’t have been/I guess it all adds up/To joy to the end.” It’s easier hearing wisdom about love and loss come from Josh’s beaming face, somehow. They said goodnight, but came back to serenade us with “The Temptation of Adam” and to rock out on “To the Dogs or Whoever.” My friend Colin (who I met because of whatbreesees.com–lucky me!) 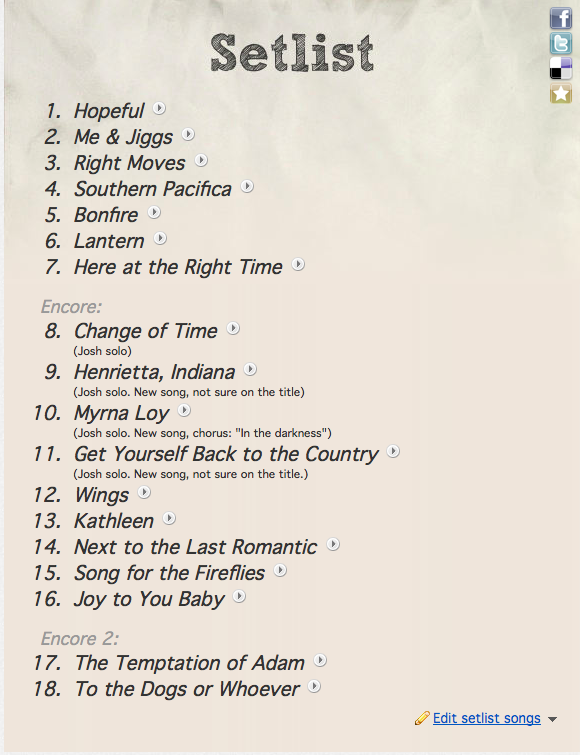 posted a set list from the night on setlist.fm (in case you’re curious about what you missed). So glad for a much needed night out with good friends and good music.